Beginning with the murder of Emmett Till in 1955, photography and photographers played an important role in advancing the African-American Civil Rights Movement by documenting the public and private acts of racial discrimination against African Americans. This article focuses on these photographers and the role that they played in the movement between 1954 and 1968, particularly in the South. 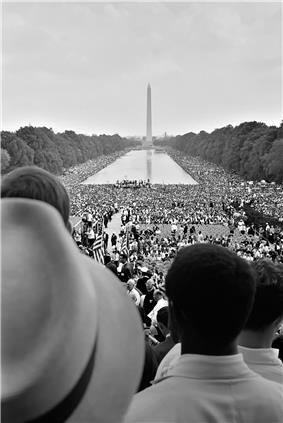 Bob Adelman volunteered as a photographer for the Congress of Racial Equality (CORE) in the early 1960s and photographed the events and the now well-known people active in the Civil Rights Movement at the time. Dan Budnik persuaded Life to have him create a long-term photo essay documenting the Selma to Montgomery march. His photographs are now in the collection of the Martin Luther King, Jr. National Historic Site. Bruce Davidson chronicled the events and effects of Civil Rights Movement, in both the North and the South, from 1961 to 1965. In support of his project, Davidson received a Guggenheim Fellowship in 1962 and his finished project was displayed at the Museum of Modern Art in New York. Upon the completion of his documentation of the Civil Rights Movement, Davidson received the first ever photography grant from the National Endowment for the Arts. Bob Fitch was the Southern Christian Leadership Conference (SCLC) photographer in 1965 and 1966. His images includes school integration, voter registration and candidate campaigns in Alabama, Mississippi and Georgia; the Mississippi Meredith March; and intimate photos of the King family during Dr. King's funeral. His pictures appeared nationally in Afro-American publications including Johnson Publishing's JET and EBONY. Photos appeared in the 1997 Smithsonian Exhibit "We Shall Overcome." Fitch's portrait of Martin Luther King Jr. in his Atlanta, GA office with a print of Gandhi on the wall, is the model for the King memorial monument being constructed in Washington D.C.
Bill Hudson (1932–2010), an Associated Press photojournalist, depictied police brutality against peaceful protesters, including the police dogs attacking students marching to talk to Birmingham's mayor during the 1963 Birmingham Children's Crusade. Warren K. Leffler was a photographer for U.S. News & World Report during the civil rights years. Although based primarily in Washington, D.C., Leffler also traveled to the South to cover many of the main events for the magazine. James H. Karales, a photographer for Look magazine from 1960 to 1971, covered the Civil Rights Movement throughout its duration and took many memorable photographs including photos of SNCC's formation, of Dr. King and his associates, and, during his full coverage of the event, the iconic photograph of the Selma to Montgomery march showing people proudly marching along the highway under a cloudy turbulent sky. In 2013 a book of his photographs, CONTROVERSY AND HOPE:The Civil Rights Movement Photographs of James Karales, was published by the University of South Carolina Press. Danny Lyon published his first photographs working for the Student Nonviolent Coordinating Committee. His pictures appeared in The Movement, a documentary book about the Southern Civil Rights Movement, as well as Memories of the Southern Civil Rights Movement, his own memoir of his years working for the SNCC. Charles Moore, in 1958 photographed an argument between Martin Luther King, Jr. and two policemen. His photographs were distributed nationally by the Associated Press, and published in Life and he began traveling throughout the South documenting the Civil Rights Movement. Moore's most famous photograph, Birmingham, depicts demonstrators being attacked by firemen wielding high-pressure hoses. U.S. Senator Jacob Javits said that Moore's pictures "helped to spur passage of the Civil Rights Act of 1964." Gordon Parks was assigned by Life in 1963 to travel with Malcolm X and document the civil rights movement. He was also involved with the movement on a personal level. In 1947, Gordon Parks documented Dr. Kenneth Clark's infamous Doll Test. It is those pictures, published in Ebony July 1947, that were used as evidence in Brown Vs. Board of Education and helped sway the ruling. Herbert Eugene Randall, Jr. photographed the effects of the Civil Rights Movement in Hattiesburg, Mississippi in 1964, at the request of Sanford R. Leigh, the Director of Mississippi Freedom Summer's Hattiesburg project. He spent the entire summer photographing solely in Hattiesburg, among the African-American community and among the volunteers in area projects such as the Freedom Schools, Voter Registration, and the Mississippi Freedom Democratic Party campaign. Only five of Randall's photographs were published in the summer of 1964. One seen worldwide was the bloodied, concussed Rabbi Arthur Lelyveld, head of a prominent Cleveland congregation and former conscientious objector to World War II. In 1999, Randall donated 1,800 negatives to the archives of The University of Southern Mississippi in Hattiesburg. He and Bobs Tusa, the archivist at USM, wrote Faces of Freedom Summer, which was published by the University of Alabama Press in 2001. Faces is the only record of a single town in the midst of America's Civil Rights movement. Moneta Sleet Jr. won the 1969 Pulitzer Prize for Feature Photography for his photograph of Martin Luther King, Jr.'s widow, Coretta Scott King, at Dr. King's funeral. Sleet is the first African American man to win the Pulitzer, and the first African American to win award for journalism. Cox, Julian; Jacob, Rebekah;& Karales, Monica (Andrew Young, forward). CONTROVERSY AND HOPE: The Civil Rights Photographs of James Karales. The University of South Carolina Press, 2013. Davidson, Bruce. Time of Change: Civil Rights Photographs 1961-1965. Los Angeles: St. Ann's Press, 2002. Faces of Freedom Summer. University of Alabama Press, 2001. Freed, Leonard. Black in White America. New York: Grossman, 1967. Kasher, Steven. The Civil Rights Movement: A Photographic History, 1954-68. New York: Abbeville, 1996. Lyon, Danny. Memories of the Southern Civil Rights Movement. Chapel Hill, N.C.: University of North Carolina Press, 1992. Moore, Charles. Powerful Days: The Civil Rights Photography of Charles Moore. New York: Stewart, Tabori & Chang, 1991. ^ Loke, Margarett (2002-04-05). "James Karales, Photographer of Social Upheaval, Dies at 71". The New York Times. ^ "Selma to Montgomery: A March for the Right to Vote". The Spider Martin Civil Rights Collection. Retrieved 2006-01-04. ^ "About Charles Moore". Kodak. Retrieved 2006-12-26. ^ "We Shall Overcome: Photographs from the American Civil Rights Era". LBJ Library and Museum. Retrieved 3-1-2007. ^ Fraser, C. Gerald (19 October 1986). "The Vision of Moneta Sleet in Show". ^ "Moneta Sleet, photographer of excellence". African American Registry. Archived from the original on 2006-12-06. Retrieved 2006-12-22.